In bowl mix together wedges and rest of the other ingredients. On a tin foil lined cooking tray, spread out wedges and bake for 25 minutes or until tender and golden. 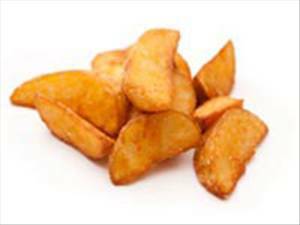 There are 231 calories in 1 serving of Baked Sweet Potato Wedges II. Calorie break-down: 52% fat, 45% carbs, 3% protein.